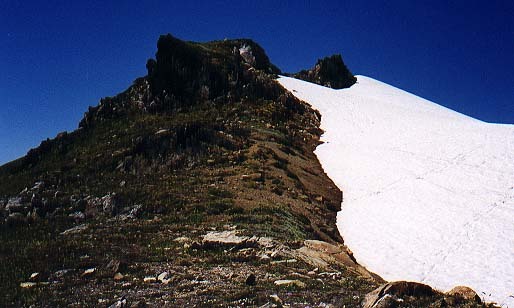 The original plans for this trip were to climb Glacier Peak via the Disappointment Peak Cleaver route (yes, Glacier Peak has a Disappointment Cleaver, just like Rainier). The prior weekend's trip up Mt. St. Helens had been intended as a test trip for my 14 year old nephew Joel and his buddy Josh, to see how well they could manage at a little bit of elevation. In addition, my brother-in-law, David, was also going to come along on this trip, which turned out to be his first alpine climbing experience. After getting up to our base camp in Glacier Peak meadows, and taking a look at the proposed route, I decided I didn't feel comfortable trying to "guide" that many inexperienced folks to the top of a 10,000+ foot volcano, even though there were two other very experienced climbers along (my brother Byron, and my climbing buddy Bill). After talking about it for quite a while that Sunday evening, a decision was made to not try for the summit, but instead to load up with full glacier gear, and head up onto the White Chuck glacier towards Glacier Gap, and practice ice axe arrest and roped glacier travel. 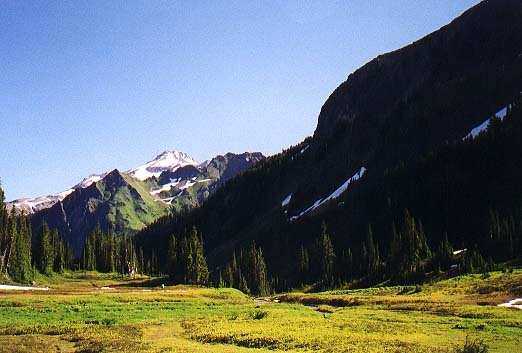 For me, the decision was made easier by how beautiful the area we were already in was - Glacier Peak Meadows is a worthwhile destination in itself, giving splendid views of Glacier Peak, White Peak, Portal Peak, the White Chuck cinder cone, Black Peak, waterfalls, meadows, creeks, and everything alpine - a truly lovely place! The trip in started Saturday evening by Bill and I driving to the White Chuck River trailhead to bivy. The rest of the group had left early that morning and were going to spend an extra day camping. Bill and I planned to bivy at the trailhead and then catch up with the rest of the group at the Glacier Peak meadows, only 12 miles from the trailhead. Out plans to get some sleep at the trailhead were foiled by a huge contingent of rampaging mice - they were dropping off of tree branches, scuttling under the other cars and trucks, and - most annoyingly - running right over my bivy bag! Finally giving up around 2 in the morning, I crawled into the truck, and managed to get a few fitful hours of rest twisted into the front bucket seat. In the morning we grabbed a quick breakfast, and then started hiking the gentle White Chuck River trail. The areas where the trail had been washed out by flooding a few years ago had all been rerouted or repaired, and the going was quite easy all the way to Kennedy hot springs. We stopped there for a few minutes to check out the springs, and I found myself wondering why anyone would actually walk the couple of hours to sit in a hole in the ground with luke warm, ugly water. This is not the finest hot spring I've seen by a long shot - I'm not sure what to attribute it's popularity to. 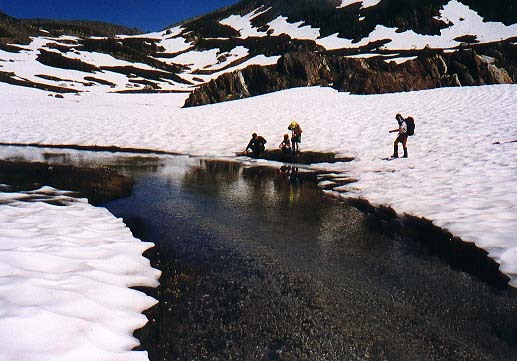 After the hot springs, the trail starts to gain elevation, moving up onto a high plateau under Glacier Peak itself. One stretch of the trail was flooded for over 100 yards along here, but the area was thick with frogs, which I thought was a good sign. Eventually, several hours later, we crossed a sturdy bridge and started switchbacking up towards the meadows. There's a second bridge along here that proved to be a perfect place to stop for lunch and to refill water bottles. The day was warm, and the cool breeze flowing down the bridged cataract was wonderfully refreshing. The way steepens after this, swithcbacking its way up into the meadows proper. There are several wonderful camp sites down low in the meadows, but it's worth the extra energy and time to climb up to the meadows directly under White Peak - the views here are stunning! We easily found the rest of our group in the process of setting up camp and exploring the area. Bill and I dropped off our heavy packs and joined in the exploration. 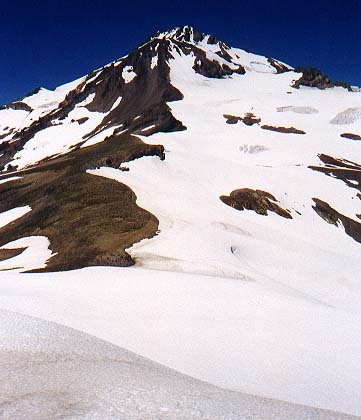 I climbed up to the top of the White Chuck cinder cone and had awesome views of Glacier Peak and the subsidiary Disappointment Peak. 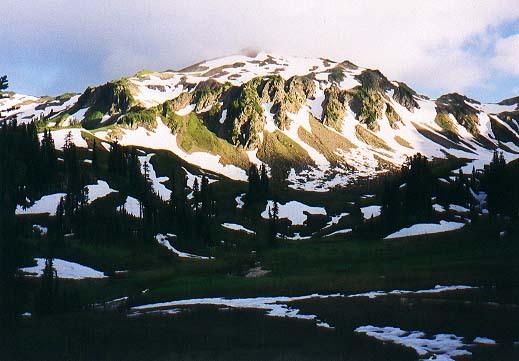 White Peak stretched invitingly to our south, and Portal Peak was close by to the west. There was still snow in most of the gullies and on most of the peaks any higher than we were, but the sun was warm, the sky was blue and cloudless, and this was a fabulous place to be on a day like today! After getting back to camp and laying out bivy bags and cooking dinner, most of us decided to go wandering until the sun went down. Josh's dad, Rick, and I crossed the small valley below us to take pictures of a beautiful little waterfall that formed the headwaters of the White Chuck river. We also got some more wonderful views of Glacier Peak itself. As soon as the sun went down, the temperature dropped, and I was happy to head back to camp and crawl into my sleeping bag. Laying there, warm and snug, it was fabulous to watch the last colors of the sun touch the tip of White Peak, then the skies dim to midnight blue while the stars came out by the thousands! After getting such a small amount of sleep the night before, and combining that with fresh air and the exercise for the day, I slept like a rock until the sunlight woke me the next morning. Since we weren't pushing for any high camp or summit this day, we started the day lazily, waiting for the sun to warm things before we fired up stoves to heat breakfast. 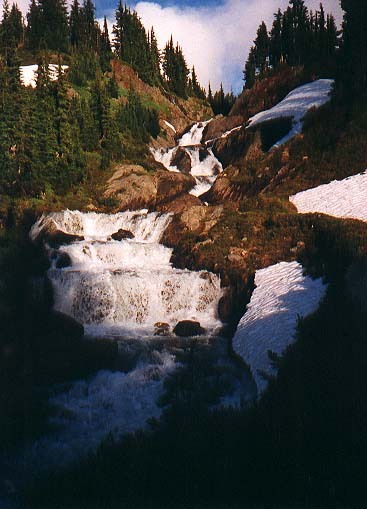 We threw all our glacier gear in our packs, and headed across the little valley to our east, eventually walking up next to the waterfall I'd taken pictures of the evening before, and into a beautiful alpine basin at the base of White Peak and Glacier Peak. 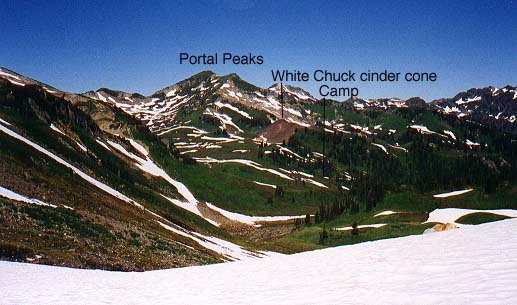 Here we turned left, starting up moderately steep snow until we arrived in another large basin, with views back towards Portal Peaks, the White Chuck cinder cone and camp. We found some good slopes to practice ice axe arrest here, and after the more experienced folks demonstrated technique, the novices all took their turns practicing and trying to show they had the hang of it. Watching how well they did, or not, as the case may be, I was more convinced than ever that we'd made the correct decision to not try for a high glaciated summit - more practice and more experience was definitely still needed before this group could safely venture up to the top of a Cascade volcano. After the ice axe arrest practice, we headed south, then east, up more gentle snow slopes, coming to yet another basin, this one with a large, mostly frozen over lake. 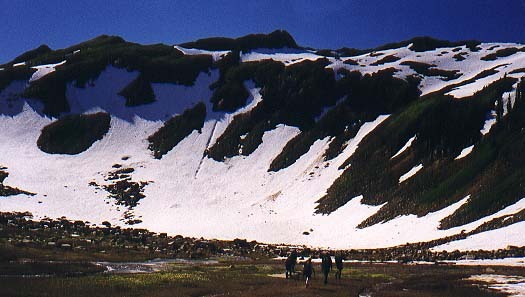 We stopped here to refill water bottles, then surveyed the surrounding slopes to determine which would best serve us in reaching the White Chuck Glacier. Choosing the most northwesterly of the gullies, we worked our way back and forth up the snow slopes, arriving at the crest to wonderful views of Glacier Peak (it had been hidden by ridges up to now), Disappointment Peak, and the old and dying White Chuck glacier stretching from us towards the mountain. We dropped down off of the ridge onto the old glacial till, and wove our way around meltwater streams and through exposed mud holes. Another party of climbers had camped up high here, as we had originally planned to do, and we watched them as they worked their way up onto one of the glacier's slopes to practice roped climbing and ice axe arrest. 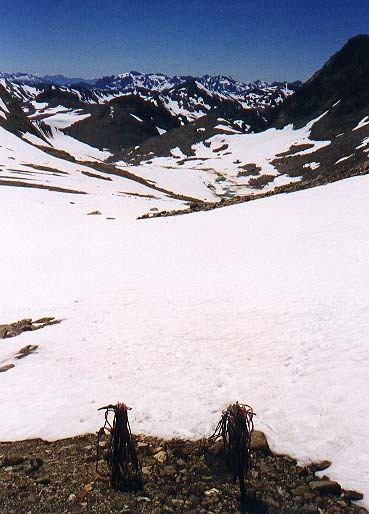 We stopped on the edge of the White Chuck glacier for lunch, and after eating broke out ropes, harnesses and helmets. Though the White Chuck is mostly a dead glacier, we thought this would be a perfect place to introduce the novices in the group to roped climbing technique, without have to really worry about crevasse rescue. Byron and Rick took the end positions on our first rope team, with Joel and Josh between them. Bill and I put my brother-in-law, David, between us, and prepared to follow the first team closely, ready to help out should one of them find a crevasse. The glacier was gentle and the traveling was easy, with no signs of any crevasses hidden underneath its surface. We headed towards Glacier Peak itself, then veered right up a steeper slop towards the top of the glacier and an area called Glacier Gap. 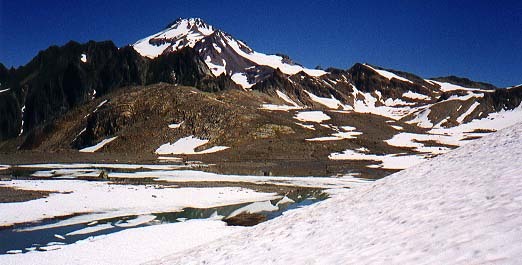 Once off the glacier, and onto the surrounding scree fields, we unroped and started climbing towards the gap. From there (about 8800') we had a pretty good view of what the rest of our route would have been. Walk along a ridge to just below Disappointment Peak, traverse closely under the Peak to its right side, then up steep slopes to an area hidden from us, but supposedly flat and easy. From there, choose any one of the snow chutes going to the summit - easy enough with a minimally competent party, but I was happy this was as high as we were going with the present crew. We spent some time scrambling up to a small rock outcropping, and Joel and Josh insisted on trundling some smallish pieces of rocks, much to my consternation. After taking some pictures, admiring the views, and discussing how much longer the route would have taken us, we started plunge stepping down the scree slopes, and heading back towards the glacier. We'd been going for quite a while, so we didn't spend much time sitting around on the way down, roping up for the short glacier crossing, then climbing back up to the first ridge, and down into the lake basin. The rest of the snow slopes down provided some good opportunities to work on glissading technique, and before we knew it we were back down in the first alpine bowl, and picking our way along the waterfall, then across the valley, then up the green slopes to our camp. After all the work of that day, dinner tasted particularly good, and the sleeping bags were extra warm and soft! The next morning we broke camp and headed back towards the trailhead. The journey out passed quickly as we worked on the "My Aunt Em loves coffee, but she hates tea" riddle. After taking far too long to solve this (we were at the Kennedy hot springs trail junction when I finally realized the pattern), I countered with a few brain teasers of my own to keep everyone's minds off the miles that were passing under our feet. The trail along the White Chuck isn't particularly scenic, just woodsy, and with 12 miles to cover that day, any diversion was welcomed. The last couple of miles seemed to be hard on the feet, and the conversations waned as everyone just concentrated on walking for another hour. The trailhead finally arrived, and we piled into three separate vehicles, one headed for the Tri-Cities, and the other two headed for Seattle.